This big-leafed hosta makes an impressive statement in shade gardens. 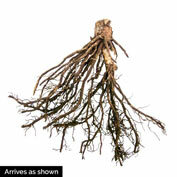 Its blue-green, heart-shaped leaves reach 10-20 in. across! Growing 30-36 in. tall with a 36-48 in. spread, Colossal Blue Hosta has a well-rounded habit. This shade perennial is an excellent choice as a foundation planting, focal point or ground cover in shade or woodland gardens. In the summer, pale lavender, trumpet-shaped flowers open above the foliage. Hostas, grown primarily for their foliage, are a low-maintenance way to add color to shaded areas. 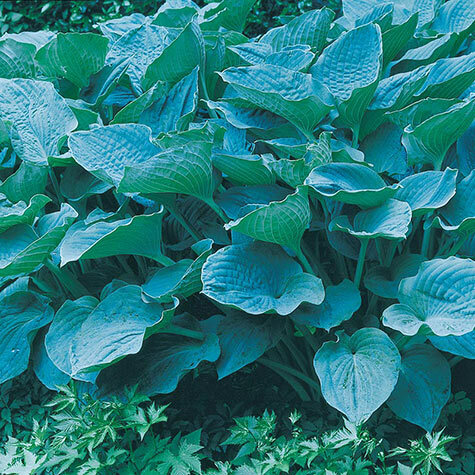 Colossal Blue Hosta grows best when planted in well-drained soil in partial to full shade. Zones 3-9. 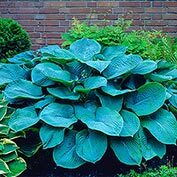 Comments: Impressive, large blue green leaves from 10 - 20 inches long, form a nice well rounded plant for a perfect shade location. Pale lavender flower spikes in Summer are an added bonus.